Branding, promotion, and the stated or implied close association with Toyota; e.g. “…Toyota, the leading lean exemplar in the world…” In this statement, the former university researchers who gave us Lean take credit for Toyota’s work. See the image below to understand why the statement makes no sense and is factually incorrect. 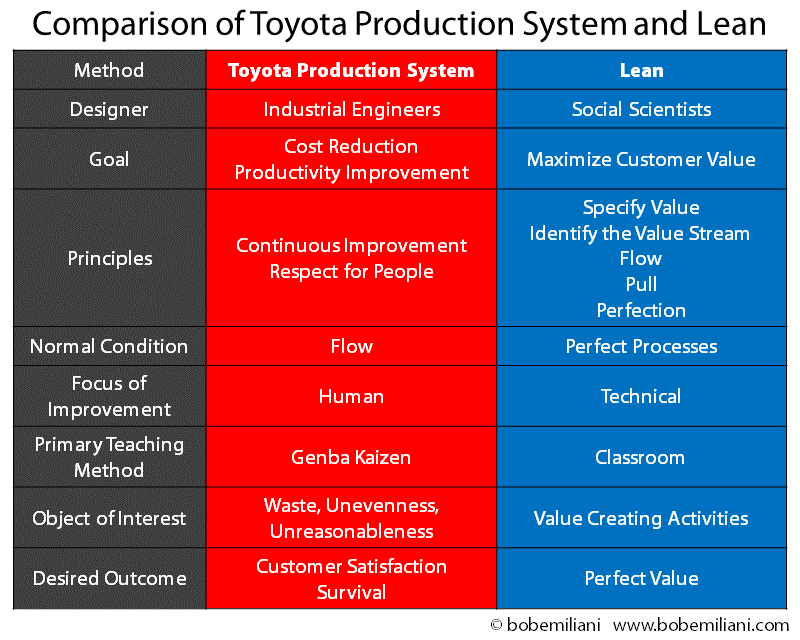 The image shows some key differences between the Toyota production system and Lean. Recall that nearly 30 years ago the two were said to be the same, but they never were. Then, around 20 years ago the two clearly started to diverge even more. Yet, the designers of Lean, James P. Womack (political science) and Daniel T. Jones (economics), have been very successful at recruiting former Toyota employees to lend great credibility and legitimacy to the impression that TPS and Lean are the same, and that Toyota practices Lean. Toyota does not practice Lean; they practice TPS. The differences are significant, which means that people think about things differently, pursue different objectives, and go about it in different ways. Is the lack of success that most organizations have with Lean the result of the differences with TPS? Does Lean actually result in tangible business results on a consistent basis? Or does it instead create a lot of work and some success stories, but little actual bottom-line improvement? Is Lean the apparent business results improver and TPS the actual business results improver? Has the confusion that has emerged as a result of advancing the idea that TPS and Lean are the same been beneficial or detrimental to the customers of Lean ? Would it help Lean’s customers to clear up the confusion? Would it help Lean, the brand, to clear up the confusion? Branding, promotion, and close association with Toyota help keep a movement alive. But if the results that organizations experience are less than expected, then these marketing strategies will take the Lean movement only so far. Inevitably, the differences between Toyota’s management system and Lean management will become more apparent and more widely viewed as the cause of limited business results. (It seems that most success stories have little to say about tangible business results; cost reduction, productivity improvement, lead-time reduction, quality improvement, etc.). For some time now, there has been a huge gap between the rhetoric of scientific thinking promulgated by Lean movement leaders and the reality that most Lean transformations fail. I have long studied the various failure modes. I have also advocated rigorous failure analysis of Lean transformations and have also freely offered the method I created and use. Plus, there is a large and growing body of academic literature analyzing this problem which must not be ignored. But the leaders of the Lean movement have consistently declined to engage in a serious effort to examine Lean transformation process failures using structured problem-solving processes. Why? One wonders whether the disinterest in formal failure analysis is because it will identify or magnify differences between Lean management and Toyota’s management system. Rationalizing Lean failure as success in the narrow sense that leaning has occurred is no comfort to executives who must come face-to-face with the need to produce business results every day. While enormous effort and resources are put into continuous branding and promotion of Lean, and also maintaining the illusory equivalence with Toyota, there is an apparent indifference to people’s struggles with Lean and a shotgun approach to recommended solutions. In fact, many abnormal conditions clearly exist and should be addressed, but they will probably never be addressed. 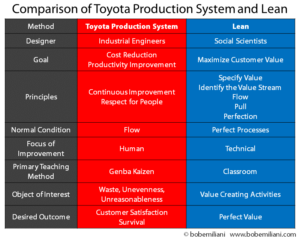 Both Toyota’s management system and Lean management can help people and organizations improve. Yet I feel there should be a clearer distinction between the two because they are different and because each requires different levels of commitment and engagement from top managers. The leadership mindset and routines may be similar, but they are not the same. Both empower employees in different ways. And Toyota’s management system and Lean management yield different business results when faithfully pursued. Isn’t it true that the organizations and leaders we recognize most for their success – Danaher (George Koenigsaecker), Wiremold (Art Byrne), Virginia Mason (Gary Kaplan), Autoliv – were all trained for many years in TPS by ex-Toyota sensei? They sensei taught managers and associates how to move the entire organizations forward using traditional industrial-engineering based kaizen (with participation from all levels). The Toyota improvement method, kaizen, along with coaching, were the principal means by which these organizations achieved success. So, in reality, the success of these organizations is attributable to Toyota’s way of thinking and doing things, not to Lean thinking. (When I asked Chihiro Nakao about Lean some time ago, he said: “I don’t know what that is.”). Which organizations have been as successful in their pursuit of Lean as shown in the image above?